A team of European researchers has become one of the first groups to successfully synthesize the 2D material germanene. Dubbed a 'cousin of graphene', the material, which is made up of just a single layer of germanium atoms, is expected to exhibit impressive electrical and optical properties and could be widely integrated across the electronics industry in the future. The material has been presented today, 10 September, in the Institute of Physics and German Physical Society's New Journal of Physics. Germanene was first proposed in 2009 but has, up until now, remained elusive. Since then, graphene has been developed further whilst other 2D materials, such as silicene, have been synthesized. Much like silicene, the proposed method for synthesising germanene is to deposit individual germanium atoms onto a substrate under high temperatures and in an ultra-high vacuum. The breakthrough by the European research team was made in parallel with an independent team from China who have reported evidence that germanene has been synthesized onto a platinum substrate. In the current study the researchers discovered, rather serendipitously, that gold could also be used as a substrate, an event which co-author of the study Professor Guy Le Lay, from Aix-Marseille University, described as 'like passing through the looking glass'. 'Following our synthesis of graphene's other cousin, silicene, we thought it natural to try and produce germanene in the same way, by despositing germanium onto a silver substrate,' Le Lay said. 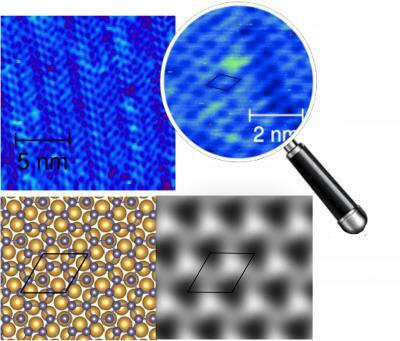 After depositing the germanium atoms onto a gold substrate, the researchers were able to confirm that the material was in fact germanene by taking spectroscopy measurements and density functional theory (DFT) calculations, which investigated the electronic structure of the material. The material was also observed under a scanning tunnelling microscope, which revealed the characteristic honeycomb structure of a 2D material. The researchers believe that with further development it may be possible for germanene to be grown on thin gold films sitting on top of a flexible substrate, which would certainly be cheaper than platinum and could allow germanene to be synthesized on a large scale. Additionally, the unique properties of germanene could make it a robust two-dimensional topological insulator, particularly up to room temperature, opening up the possibility of using the material in quantum computing. Professor Le Lay continued: 'We have provided compelling evidence of the birth of nearly flat germanene -- a novel, synthetic germanium allotrope which does not exist in nature. It is a new cousin of graphene.